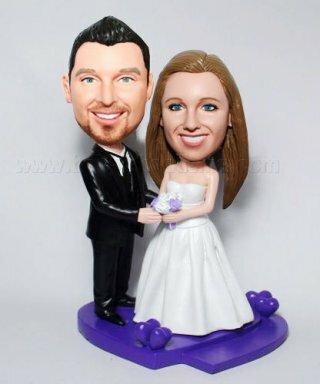 With white gown and black suit,they are standing 7 inches on a purple heart base, which means " you are always in my heart". 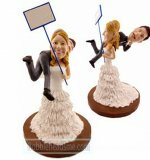 Isn't it perfect to be a wedding cake topper or anniversary gift? Go head,order one for yourself or your friends who are happened to get married. It will be a very big hit in every scence. 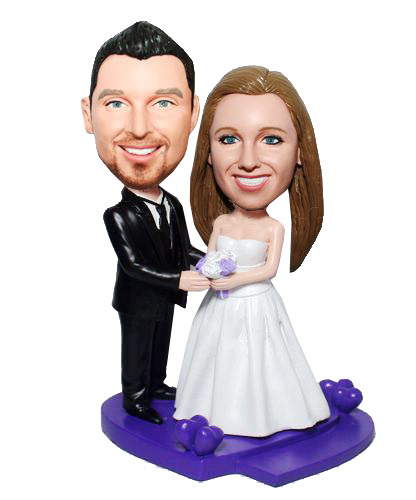 We love our lovely bride&groom wedding bobbleheads. The communication was first rate. The shipping was even better. We received our confirmation email with the tracking number and we could track my order. They arrived on the day they was supposed to and We couldnt be more pleased with our purchase. 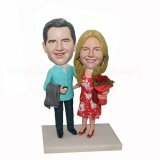 Quality of the item was great, great replicas of ourselves!!! Perfect for our cakes!! And they were a talking point at the wedding. We will definitely be using this website again and will be tweeting and recommending this company to all our family and friends.